I have been seeing commercials for years about those sonic facial brushes and I never really thought I needed one. I have pretty good skin and I have my daily regimen that works (or so I thought). I got the opportunity to review the Instrumental Beauty sonic facial brush and decided to have an open mind. What does a sonic brush even do? Well, it uses sonic vibration technology to penetrate your pores to remove impurities that regular face washing misses. All this time I was thinking that my every day face washing routine was more than enough. Boy, was I wrong! This amazing sonic facial brush has a sleek design and comes with 2 ultra soft bristle pads that fit securely on its own caddy/charging station. When I held the brush in my hand for the first time, I had to figure out how to charge it. It showed no battery unit from the outside. It is actually inside and the unit is made to be waterproof which means you can take it on the shower. This is especially helpful if you are using it on your neck. The instructions state that you must charge the unit for the first time for 16 hours. It lights up in a bright blue so you might want to leave it charging in a room that you are not trying to sleep in. The brush has 3 speeds and it is very important to not use a lot of pressure when you put it against your skin. Trust me on that one! Also, make sure you are generous with the amount of water you put on the bristles. A dry brush will make you feel like you are scraping your skin. Again, trust me on that! You can use your favorite face wash or soap with this brush and you are well on your way to the most clean and smooth skin ever! 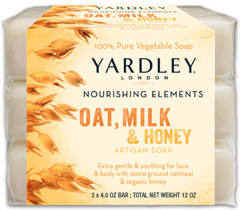 Speaking of soap, you must try out Yardley of London's New Nourishing Elements Artisan Soap. 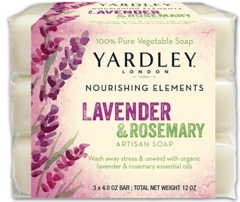 it is made with 100% sustainable vegetable oils, natural butters and botanicals. They are extra gentle on all skin types and are cruelty-free and biodegradable. They are available in in 2 varieties; Lavender & Rosemary and Oat, Milk & Honey. They retail for $4.99 for a 3-pack and can be found at drugstores nationwide. The Oat, Milk & Honey is my favorite! Okay, back to the brush--- Once I figured out how the speeds worked as well as how much face wash I needed, I was well on my way to glowing skin. This brush is especially good because it has a built-in timer that pauses the unit for a couple seconds to remind you when it is time to move bristles to another area of your skin. I have been using my sonic facial brush once a day and I especially love the convenience of taking it in the shower with me. Overall, I really love the Instrumental Beauty sonic facial brush and highly recommend it to anyone looking for one. It would even make a nice Mother's Day gift. The Instrumental Beauty Sonic Facial Brush can be purchased at select drugstores and at InstrumentalBeauty.com for $80.00. I received a sonic facial brush unit and soap samples for review purposes. All opinions are 100% my own as always. I just purchased one very similiar to this. I love it. Can you believe I don't even own a facial brush? 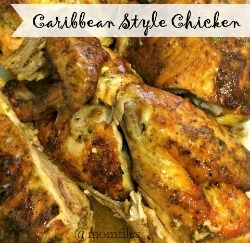 I'd love to try this out!